Display Network is a different ballgame altogether. Unlike in Search Network where your targeted users know exactly what they are looking for, in Display Network you will have to reach out to those people who are not sure about what they want. In short, Display Network is a great tool that helps you reach out to people who might not be familiar with your product and therefore not actively looking for similar solutions. 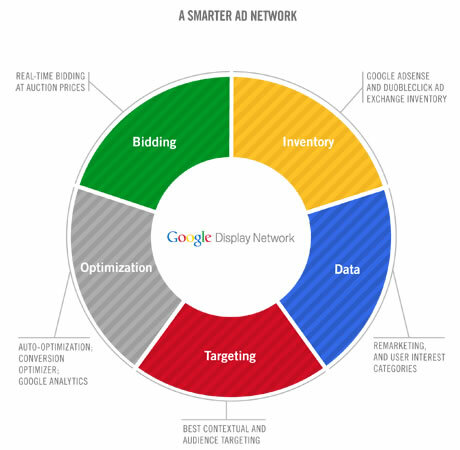 So, as evident, Google Display Network offers advertisers the opportunity to identify prospective customers and to get their products in front of them. It is good to know that Google Display Network is as of now the largest display network platform in the world with almost 90% of all the internet users under its ambit. To be precise, 94% of all US based users are within the reach of this powerful Display Network Platform. With Google Display Network, you will be able to get your product advertised on 120 top websites, on the world’s largest blogging platform – Blogger, on the world’s biggest email service – Gmail and also on the world’s largest video sharing platform – YouTube. Google Display Network comes loaded with hundreds of different options so that advertisers can fine-tune their campaign and reach out to a specific group of people that they feel might be interested in their product/ service. In this method, advertisers will be targeting specific group of users based on some criteria and they will serve them ads irrespective of what types of websites they are visiting. It is a great feature that lets you target those people who share similar interest as evident from their historical browsing behavior. This feature is ideal for those advertisers who have seen some success with remarketing campaign earlier. Unlike remarking campaign where you target those visitors who might have shown some interest in your products earlier, Similar Audience feature lets you reach out to new group of people who might be looking for the same service. This is by far one of the most powerful features of Google Display Network. This feature will enable you to target those audience who have visited your website earlier but somehow, they did not get converted. It also allows you to target those audience who might have opted for your product/service in the past and you want them to do it again. It is a cool tool that lets you serve custom message/ad to selected group of people who might get converted eventually if pushed a little hard. Interest Targeting is another cool feature that lets you target people based on their recently viewed websites. This is a great way to identify new audience who can be your future customers. The idea behind this is to show your ads to those people who are browsing similar websites like yours. Affinity targeting may appear similar to that of Interest targeting but in reality, they are poles apart. This feature allows you to target those audience who tend to visit a set of websites on a regular basis. It is like targeting experience users who know what they are looking for. This tool lets you target those audience who browsing behavior shows a sudden spike in some topics that coincide with your product/service. For example, if you are offering ‘Income Tax Return Service’, this feature will let you target those people have started searching for the term – ‘income tax’ lately. So basically this ‘In Market’ feature lets you reach out to people who are ‘currently’ looking for the same product or service. This method lets you target a set of websites and that means by competing with other advertisers, you will be able to show your ads to all the visitors of those websites. This is a simple and direct way to target audience. All you have to do is to choose a set of websites / URLs where you want to display your ads and then set the budget per click and you are done. Display Planner Tool is something that you should get your hands dirty with. This tool will give you fair idea about what types of ad format you should be using for a specific website. It also helps you to make cost estimate and analyze traffic of a website. This targeting method will allow you to select web pages that are built around a specific topic. For example, if you are selling MacBook Pro, you will be able to display your ads on those web pages where people are discussing about Mac or MacBook. This method is almost similar to that of Managed Placement with the only difference is that here you will get to choose web pages websites based on topics. What if your topic is not listed in the hundreds of topics included by Google Adwords in the Topic Targeting? Well. Don’t worry because with Keywords Contextual Targeting, you will be able to target people who might be interested in your product by creating a list of keywords and then targeting web pages that have contextually similar content. So, these are some methods that you need to employ to locate new customers via Google Display Network.